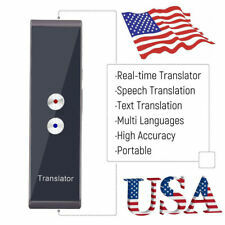 Multiple Languages Translation: Support up to 26 languages translation. You can open the APP and speak to the earphone, then it will translate into the voice of the country you want. Bluetooth 4.1 EDR Technology: Optimized Bluetooth 4.1 version allows stable and fast audio transmission, easy to connect to your Bluetooth devices in seconds. 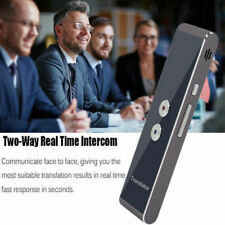 Clear sound quality, no noise, and easy to carry, a perfect assistant of language translation. Multiple Languages Translation: Support up to more than 30 languages translation, each language can be translated to each other. Features: Multiple languages translation, support up to 25 languages translation, with APP support Android and iOS system. Bluetooth wireless connection, optimized Bluetooth 4.2 version allows stable and fast audio transmission. Easy to connect to your Bluetooth devices in seconds, up to 10m connection distance. HiFi audio effect and keeps bass more surging, bring unexpected smooth and clear music to your ears. In-ear design, mini and compact, stable and comfortable for driving, running, travel and other indoor or outdoor activities. Built-in 90mAh rechargeable lithium battery, ensures super endurance, support playing for up to 5-8 hours, talking for up to 4.5 hours. Specifications:. Multi-functional: With favorites and recording function, compare with other translator, the translator can reserve your translation record(Up to 20 recording records can be collected currently), more convenient. Headphone battery capacity: 55mAh. 2 Earphone. Headphone size: 37.8 18 26.3mm. Bluetooth standard: 5.0. Support: HSP/HFP/AD2P/AVRCP/AAC. (Chinese) Simplified Chinese, (Hong Kong, China) Chinese, (Taiwan) Chinese, (US) English, (UK) English.